A dental crown is required to cover the damaged part of a tooth and to make it strong, stable, and last longer. However, dental crowns can be quite expensive in the United States and Canada and beyond the financial means of many. The good news is that the cost of dental crowns in Mexico is much lower and one can have them south of the border without cutting corners. So how much are dental crowns in Mexico? The cost would depend on the material used. 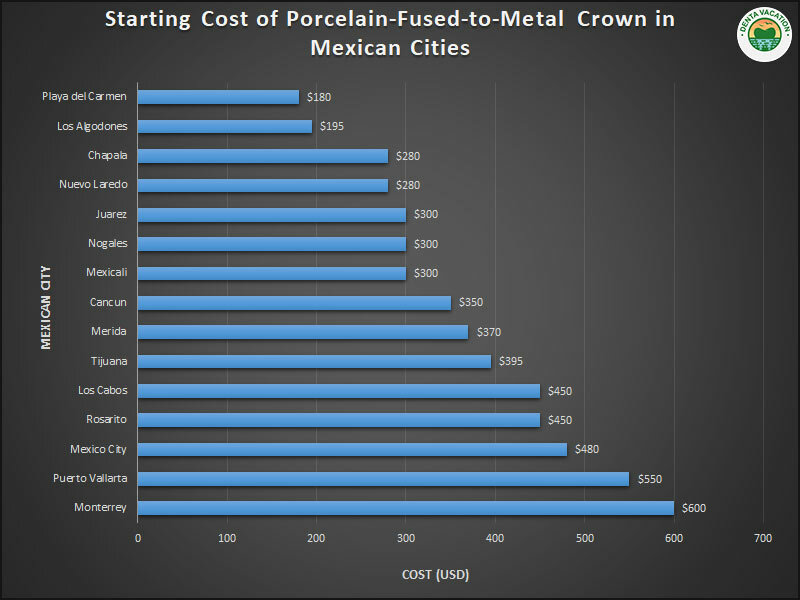 The cost of porcelain-fused-to-metal can be between $500 and $1,500. In the United States, base metal alloy crowns start at $750 and may go up till $2,400 a piece. An all porcelain dental crown is approximately between $1,000 and $3,000. The final cost depends on whether or not one has dental insurance. Dental tourism offers you dental crowns at a fraction of the cost. 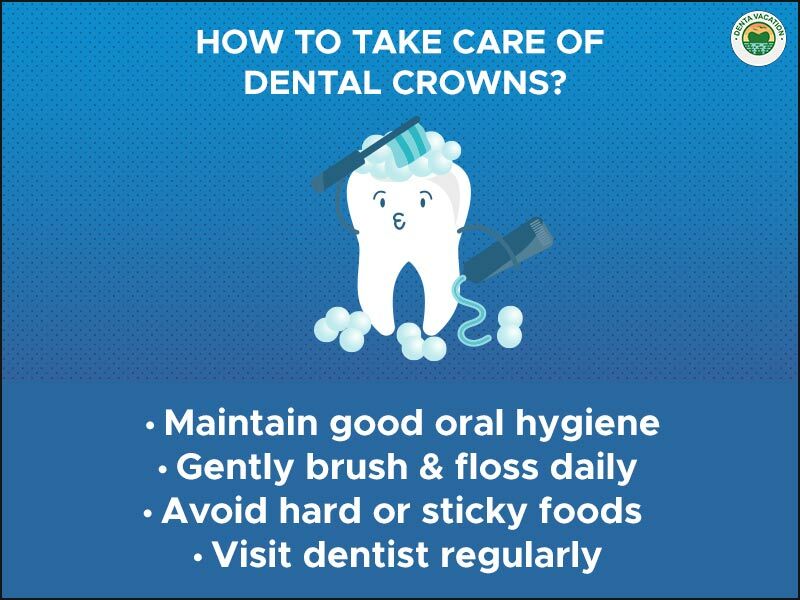 There are many uses of a dental crown. It protects a weak tooth from cracking, is a cover for a tooth with a root canal, and is also a tooth replacement option! Contact us to inquire about dental crowns abroad now! As is apparent from the table above, Mexico provides dental services at a fraction of the prices quoted in Canada and the United States. Los Algodones is the undisputed “molar capital.” Home to hundreds of dental offices, Algodones is conveniently located just about seven miles west of Yuma, Arizona. One can expect to save almost 70% of US prices here. Cancun is another Mexican city that offers affordable dental care. It is a beautiful resort city in the state of Quintana Roo and is famous for its beautiful beaches and pulsating nightlife. It is quite popular with spring-breakers and is also home to several state-of-the-art dental clinics manned by competent staff. Puerto Vallarta also has a number of dental experts with specialized skill sets. Getting dental crowns in PVR, as the city is popularly called, will give you an opportunity to rest and rejuvenate in a tropical setting. Great options for dental tourism, Tijuana and Rosarito offer a porcelain crown with abutment starting roughly at $500 and $750 respectively. Tijuana is a border city just about 17 miles from San Diego, California. It has the distinction of being the busiest border crossing in the world. Rosarito is a picturesque resort city in the state of Baja California at just about half an hour drive from Tijuana. 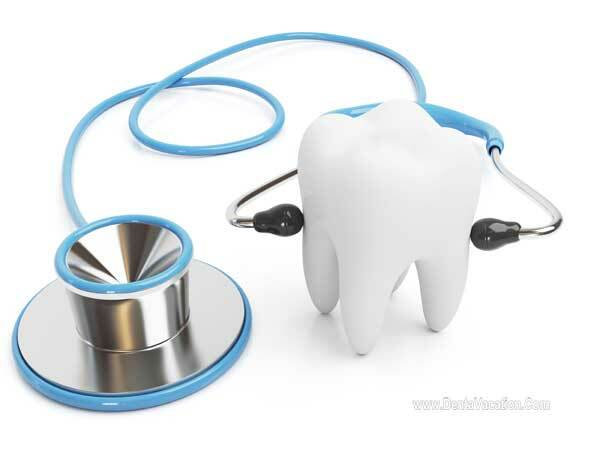 The quaint place is home to a modern dental clinic run by a highly experienced dental surgeon. A dental cap or “crown” is a prosthetic that is put over a tooth which is either misshapened, cracked, or broken. The idea is to restore shape and size to the tooth, or enhance its aesthetics. A crown can only be inserted or removed by a dentist. Porcelain-Fused-to-Metal Crown: This kind of dental crown is durable and stronger than the regular porcelain dental crowns. All Porcelain Crown: Built by firing and stacking, all porcelain is a kind of ceramic that gives the dental crown the most natural look. It is translucent and has the maximum aesthetic appeal. Ceramic Crown: Ceramic dental crowns blend with the natural teeth and therefore, are commonly used to restore front teeth. Base Metal Alloy Crown: They are highly resistant to corrosion. Dental crowns made from base metal alloys require a very little part of the tooth to be filed down before their fitting. What is the Need for Dental Crowns? They are used to top dental implants and replace missing teeth. They provide a stable support to a dental bridge. As a support to a large tooth with huge fillings, dental crowns are also used to mask discolored or broken teeth. Did you know: If not much of the tooth is left, the dentist has to build it up a bit to fit the dental crown! 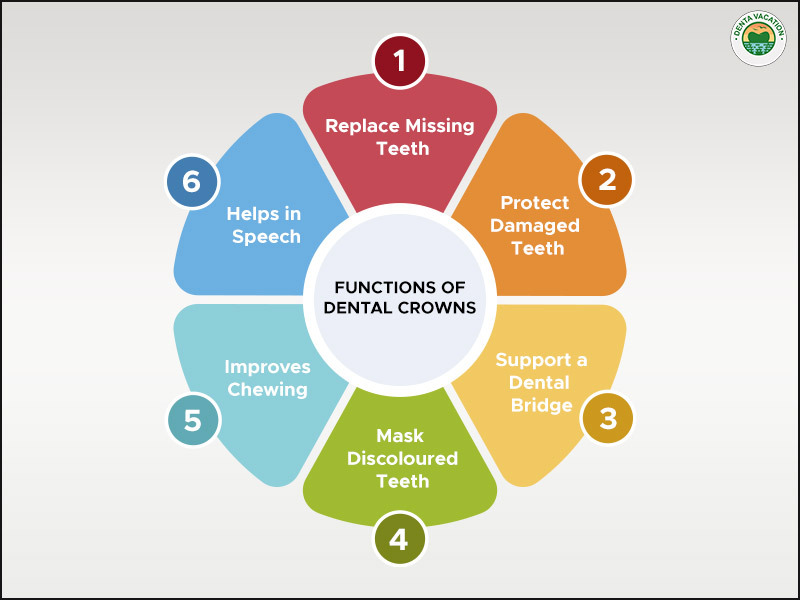 Read on to find out more about dental crowns! In the first visit the dentist makes a molded impression of the patient’s tooth which is sent to the dental lab. During this visit, a temporary crown is made to protect the tooth till the time the final crown has been created. It takes approximately 2-3 weeks to make a dental crown. On the following visit, the patient is given local anesthesia to numb the tooth and the gum tissue that surrounds it. The tooth on which the dental crown is to be placed is filed down to accommodate the crown. The amount of tooth that needs to be filed depends on the type of crown being used. The crown placed over the tooth fully covers it from above the gum line. Avoid sticky food as it might get stuck to the dental crown and dislodge it. It is better not to use that side of the mouth that has the new dental crown for chewing food. Hard foods like carrots, apples should not be consumed because chewing such foods requires more force and can put the crown at risk of getting damaged. When food gets stuck around the dental crown, slide the floss out instead of pulling it up. Good oral hygiene habits are a must. On experiencing even the slightest of discomfort while biting, visit your local dentist. If the crown falls out, get it fixed as soon as possible or the following day. For MORE information, please fill the contact form and we will get back in touch with you! Porcelain-Fused-to-Metal Crowns versus All-ceramic Crowns: A Review of the Clinical and Cost-Effectiveness [Internet]. Ottawa (ON): Canadian Agency for Drugs and Technologies in Health; 2015 May 29. CONCLUSIONS AND IMPLICATIONS FOR DECISION OR POLICY MAKING.Available from: https://www.ncbi.nlm.nih.gov/books/NBK304696/ Last Accessed: 6 Nov. 2017.